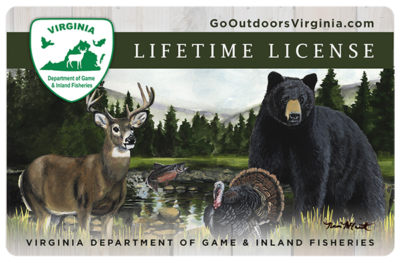 Open the door to a lifetime of enjoyment in the great outdoors of the Commonwealth of Virginia with a Lifetime Hunting, Freshwater, Trout and/or Saltwater Fishing License and leave an endowment for future generations of Virginia’s wildlife enthusiasts. In addition to the standard paper lifetime license, for an additional fee customers can add a durable credit card-style license (pictured here) that fits easily in your wallet. The lifetime hunting license is valid for small game only. The holder of this license is required to obtain all additional state and local licenses (the current deer and turkey license, bear license, archery license, muzzleloader license, bonus deer permit, national forest permit, and other permits are required in addition to the lifetime hunting license if you participate in these activities).